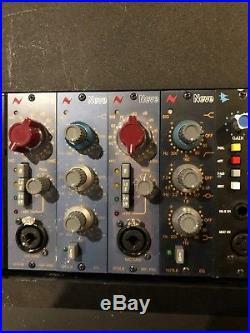 I have 2 Available Launched in 1970, the 1073 is the first choice of leading producers and artists, delivering the unique Neve sound on some of the most famous recordings of the past 40 years. The big, punchy sound of the 1073 complements any musical genre - from rock to pop, hip-hop to rap, thrash to classical. And now it is available for your Lunchbox. Designed and manufactured in England, the 1073LB retains the unique sonic characteristics of the original 1073 Classic microphone preamplifier by using the same architecture, matching components and original hand-wound transformers. And it delivers it in a modern and portable form-factor that professional producers and engineers demand. With new features like a fine TRIM control, switchable microphone input impedance, signal presence LED, intelligent protected switching of front combi-XLR input connector and Neve's clever Audio Processing Input design, the 1073LB takes your Lunchbox to the next level. Simply install into an empty slot in your compatible Lunchbox rack, connect your microphone or line level signals and inject that legendary sound into your audio creations. The item "AMS Neve 1073LB 500 Series Lunch Box Mic Preamp" is in sale since Saturday, December 30, 2017. This item is in the category "Musical Instruments & Gear\Pro Audio Equipment\Preamps & Channel Strips". The seller is "ezpmuzik1" and is located in Pompano Beach, Florida.